Guǎngxī (more properly Guǎngxī Zhuàngzú Zìzhìqū, the Guǎngxī Zhuàng Autonomous Region) is an autonomous province of China, located in the extreme south of the country adjacent to Vietnam. Historically the Guǎngxī region was landlocked, but in 1952 the People's Republic transferred the westernmost coastal portion of Guǎngdōng Province to Guǎngxī. This decison was reversed in 1955 and then reinstated in 1965. The coastline of Guǎngxī extends for about 200 km (125 mi) along the north end of the Gulf of Tonkin. Běihǎi (formerly Pakhoi) and Qīnzhōu are the major ports. 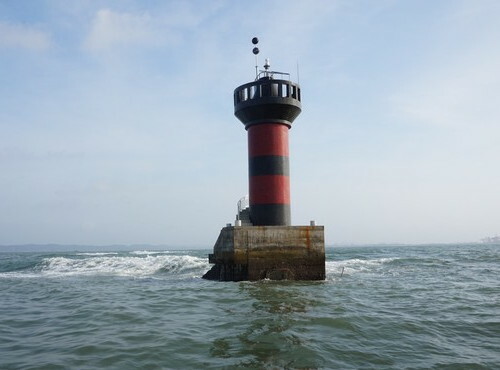 Lighthouses in China are maintained by the PRC Maritime Safety Administration. The administration is organized in four regional administrations, with district offices in the major ports. The lights on this page are maintained by the Zhànjiāng MSA office in Guǎngdōng, which is included in the Guǎngzhōu Region. The pinyin system for transliterating Chinese into Latin characters is now the international standard, but some locations continue to be known also under the spellings of older transliteration systems. 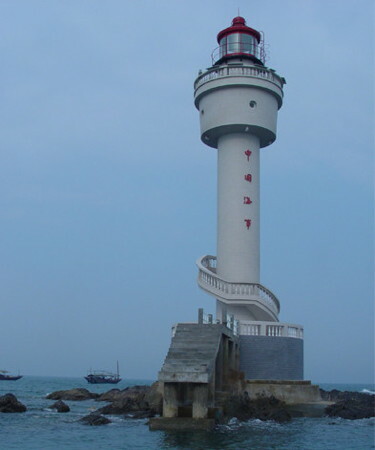 The Chinese word for a lighthouse is dēngtǎ (灯塔). In pinyin jiāo (formerly chiao) is a reef or rock, jiǎo is a cape or headland, dǎo (tao) is an island; yǔ (tsu) is a small island, wān is a bay and gǎng (kang) is a harbor. ARLHS numbers are from the ARLHS World List of Lights. CN numbers are the serial numbers used by the Shànghǎi regional office of MSA. Admiralty numbers are from volume P of the Admiralty List of Lights & Fog Signals. U.S. NGA List numbers are from Publication 112. A useful tool for juggling the representations of Chinese names. A fine collection of U.S. Army Map Service maps of China, in English, posted by the University of Texas Library. Navigation chart information for the Gulf of Tonkin. Note: Běihǎi is a relatively new, rapidly-growing port city with a population of more than 1.5 million. The city's name, literally "North Sea," refers to its location at the north end of the Gulf of Tonkin (Běibù Wān). 2002 (station established 1956). 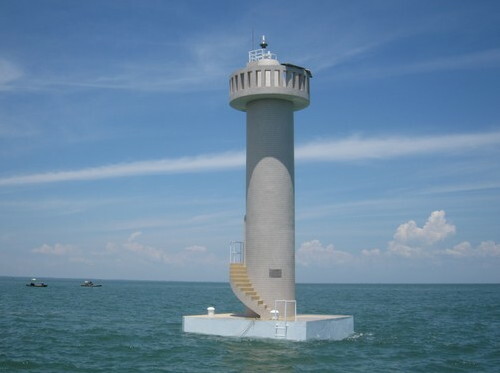 Active; focal plane 97 m (318 ft); white flash every 10 s. 24 m (79 ft) round cylindrical concrete tower with lantern, gallery, and a large octagonal observation room, rising from a 1-story octagonal base. Lighthouse painted white, lantern red. 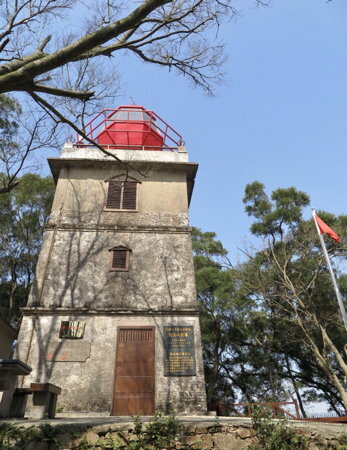 A photo is above, another page for the lighthouse is available, a 2008 photo shows the top of the lighthouse, TianCong Lyu has a closeup street view, and Google has a distant satellite view of the station. The original lighthouse was a 15 m (49 ft) skeletal tower; it was replaced in 1969 by a stone tower of similar height. Wéizhōu is a volcanic island in the Gulf of Tonkin, about 50 km (30 mi) south of Běihǎi and a similar distance west of the Léizhōu Peninsula in Guǎngdōng. The island, then known as Weichow, was occupied by France in the late 1800s and added to French Indochina. Nationalist Chinese troops recaptured it from the Japanese in July 1945 and held it until Communist troops took the island in early 1950. Wéizhōu is about 6.5 km (4 mi) in diameter and has a permanent population of about 16,000. It is accessible by passenger ferry from Běihǎi and is a popular destination for day trips. The lighthouse is located near the southernmost point of the island. Site open, tower open to the observation level. CN-4878; Admiralty P3326; NGA 20096. Date unknown. Active; focal plane and light characteristic unknown. No description or photo of this light available but Google's satellite view shows a substantial hexagonal cylindrical tower. Located atop a steep bluff at the southeastern corner of Wéizhōu. Site status unknown; there is a road to the lighthouse. Admiralty P3326.28. Date unknown. Active; focal plane 37 m (121 ft); white flash every 4 s. 34 m (111 ft) square skeletal tower, painted white. No photo available but Google's satellite view probably shows the tower. Located on a point of land at Shātián, on the east side of the entrance to the Dāndōu estuary. Site status unknown. CN-4889; Admiralty P3319.8. 2010 (station established 1961). Active; focal plane 13 m (43 ft); white flash every 4 s. 14 m (46 ft) round white concrete tower mounted on a square concrete pier. A photo is at right and Google has a satellite view. Located on a shoal off a new port on a shallow embayment at the northeastern corner of the Gulf of Tonkin. Accessible only by boat. Site status unknown. CN-4884; Admiralty P3319.96. Date unknown. Active; focal plane 24 m (79 ft); two white flashes every 6 s. 24 m (79 ft) square skeletal tower, painted white. No photo available, but the shadow of a tower is faintly visible in Bing's satellite view. This lighthouse also faces Běibù Bay. Located on heights above the entrance to the Yíngpán estuary, about 30 km (19 mi) east of Běihǎi. Site status unknown. CN-4890; Admiralty P3319.783. 2008. Active; focal plane 12 m (39 ft); green flash every 4 s. 8 m (26 ft) round concrete tower. Entire lighthouse is green. Lài Lù Wén has a very distant view of the breakwater lights and Google has an indistinct satellite view. Guǎntóulíng is a town at the end of the Yínhǎi Peninsula. Located at the end of the east breakwater of Nánwān (South Bay) harbor at Guǎntóulíng. Accessible by walking the pier. Site open, tower closed. Admiralty P3320.25. 2008. Active; focal plane 12 m (39 ft); red flash every 4 s. 8 m (26 ft) square cylindrical concrete tower. Lighthouse painted with red and white horizontal bands. Lài Lù Wén has a very distant view of the breakwater lights and Google has an indistinct satellite view. Located at the end of the west breakwater of Nánwān (South Bay) harbor at Guǎntóulíng. Accessible by walking the pier. Site open, tower closed. Admiralty P3320.26. Date unknown. Active; focal plane about 15 m (49 ft); light characteristic unknown. Approx. 12 m (39 ft) round barbell-shaped tower, painted with red and white horizontal bands and mounted on a square 1-story rubblestine tower. A photo and a second photo (halfway down the page) are available and Google has a satellite view. Located on a rock just off the tip of the Guǎntóulíng peninsula. Site status unknown. Admiralty P3320.28. Date unknown (station established 1933). Active; focal plane 120 m (394 ft); white flash every 3 s. 13 m (43 ft) octagonal lantern mounted atop a square 3-story building. Lantern painted red. A photo is at right and Google has a satellite view. A giant radar station nearby draws much more attention than the lighthouse. Located atop a high ridge on the west side of Běihǎi. Site status unknown. CN-4895; Admiralty P3320; NGA 20092. Date unknown. Active; focal plane 22 m (72 ft); continuous red light. 23 m (75 ft) skeletal tower, carrying a triangular daymark point up, mounted atop a warehouse. No photo available, but Google has an indistinct satellite view. The range guides vessels into the new harbor (xīngǎng) of Běihǎi. Located on the waterfront of the harbor. Site and tower closed. Admiralty P3320.5; NGA 20087. Date unknown. Active; focal plane 28 m (92 ft); continuous red light. 30 m (98 ft) skeletal tower carrying a triangular daymark, point down. No photo available, but Google has an indistinct satellite view. Located 340 m (0.2 mi) south southeast of the front light. Site status unknown. Admiralty P3320.51; NGA 20087.1. Date unknown. Active; focal plane 16 m (52 ft); continuous red light. 13 m (43 ft) square pyramidal skeletal tower, painted black and carrying a black triangular daymark, point up. No photo available, but Google has an indistinct satellite view. The range guides vessels into the traditional inner harbor (nèigǎng) of Běihǎi. Located on the waterfront of the harbor. Site and tower closed. Admiralty P3321; NGA 20088. Date unknown. Active; focal plane 23 m (75 ft); continuous red light. 21 m (69 ft) square pyramidal skeletal tower, painted black and carrying a black triangular daymark, point down. No photo available, and the tower is not seen in Google's indistinct satellite view. It's possible this light is now mounted on one of the modern buildings in this area. Located 150 m (500 ft) south southeast of the front light. Site status unknown. Admiralty P3321.1; NGA 20088.1. 2005 (station established 1958). Active; focal plane 39 m (128 ft); white flash every 4 s. 21 m (69 ft) round cylindrical concrete tower with lantern and gallery, rising from a 1-story equipment building. A photo is at right, a page for the lighthouse is available, a distant view and a second view are available, and Google has a satellite view of the station. The original lighthouse, an 18.5 m (61 ft) round concrete tower, was replaced because it had become dangerously undermined. 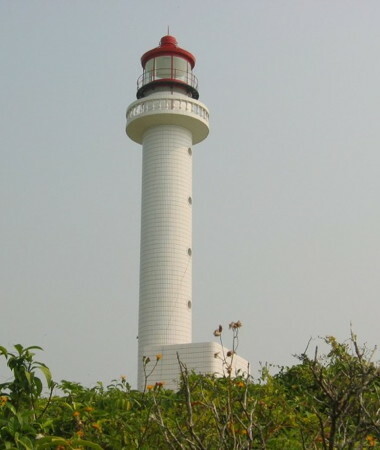 The lighthouse marks the eastern entrance to Qīnzhōu Bay (the northernmost embayment of the Gulf of Tonkin). Located on an island about 2 km (1.25 mi) off the point of land at the east side of the entrance to the bay. Accessible only by boat. Site status unknown. Admiralty P3319.78; NGA 20093.5. Date unknown. Active; focal plane 8 m (23 ft); red flash every 4 s. 12 m (39 ft) round cylindrical concrete tower mounted on a square platform supported by piles. Entire lighthouse is red. No photo available but Google has a satellite view. Located in the entrance to the Lù'ěrhuán River, on the east side of Qīnzhōu Bay. Accessible only by boat. Site status unknown. CN-4912; Admiralty P3319.72. Date unknown. Active; focal plane 9 m (30 ft); white flash every 4 s. 12 m (39 ft) round cylindrical concrete tower mounted on a square platform supported by piles. Entire lighthouse is red. No photo available but Bing has a satellite view. Located in the entrance to the Lù'ěrhuán River, on the east side of Qīnzhōu Bay. Accessible only by boat. Site status unknown. CN-4913; Admiralty P3319.7. Date unknown. Active; focal plane 25 m (82 ft); white flash every 4 s. 14 m (46 ft) round cylindrical concrete tower with gallery. Entire lighthouse is white. No photo available but Google has a satellite view. Located on a small island on the east side of the entrance to Qīnzhōu Bay. Accessible only by boat. Site status unknown. CN-4923; Admiralty P3319.2; NGA 20093.66. Date unknown. Inactive since 2017. 6 m (20 ft) round concrete tower, painted red. No photo available but Bing has a satellite view. Located on a shoal just northeast of Qīngcáitóu Dǎo. Accessible only by boat. Site status unknown. CN-4924; ex-Admiralty P3319.22. 1997 (station established 1970). Active; focal plane 8 m (26 ft); red flash every 3 s. 8 m (26 ft) round cylindrical concrete tower with gallery, covered with white ceramic tiles. No photo available but Bing has a satellite view. Located on a shoal in the south entrance to the passage between Qīnzhōu Bay and Máowěi Bay. Accessible only by boat. Site status unknown. CN-4925; Admiralty P3319.5; NGA 20093.7. 1997 (station established 1969). Active; focal plane 9 m (30 ft); white flash every 3 s. 9 m (30 ft) square concrete tower, covered with white ceramic tiles. the lighthouse also has a black vertical stripe, perhaps indicating that it is the rear light of a range. A photo is at right and Google has an indistinct satellite view. This light and the Dongshaoshi light frame the narrow passage between Qīnzhōu Bay and Máowěi Bay about 5.5 km (3.5 mi) north northwest of the entrance. Located on the east side of the passage. Accessible only by boat. Site status unknown. CN-4935; Admiralty P3319.576. Date unknown. Active; focal plane 7 m (23 ft); red flash every 4 s. 13 m (43 ft) round cylindrical concrete tower mounted on a square platform supported by piles. Entire lighthouse is red. No photo available but Bing has a satellite view. Located on a shoal in the north entrance to the passage between Qīnzhōu Bay and Máowěi Bay. Accessible only by boat. Site status unknown. CN-4938; Admiralty P3319.583. Date unknown. Active; focal plane 13 m (43 ft); green flash every 4 s. 11 m (36 ft) round cylindrical concrete tower mounted on a square platform supported by piles. Entire lighthouse is green. No photo available but Bing has a satellite view. Located on the south side of the entrance to the Máolǐng River, on the west side of Máowěi Bay. Accessible only by boat. Site status unknown. CN-4938.19; Admiralty P3319.6. Date unknown. Active; focal plane 8 m (26 ft); green flash every 4 s. 12 m (39 ft) round cylindrical concrete tower mounted on a square platform supported by piles. Entire lighthouse is green. No photo available but Bing has a satellite view. Located south of the entrance to the Máolǐng River. Accessible only by boat. Site status unknown. CN-4938.17; Admiralty P3319.602. Date unknown. Active; focal plane 7 m (23 ft); red flash every 4 s. 11 m (36 ft) round cylindrical concrete tower mounted on a square platform supported by piles. Entire lighthouse is red. No photo available but Bing has a satellite view. Located in the southwestern area of Máowěi Bay, near the town of Dàshān'ào. Accessible only by boat. Site status unknown. CN-4938.15; Admiralty P3319.5817. Date unknown. Active; focal plane 7 m (23 ft); red flash every 4 s. 11 m (36 ft) round cylindrical concrete tower mounted on a square platform supported by piles. Entire lighthouse is red. No photo available but Bing has a satellite view. Located in the southwestern area of Máowěi Bay, near the town of Dàshān'ào. Accessible only by boat. Site status unknown. CN-4938.13; Admiralty P3319.5815. 1971 (rebuilt 1997). Active; focal plane 6 m (20 ft); red flash every 3 s. 6 m (20 ft) square pyramidal concrete tower, covered with white ceramic tiles. The tiles were probably added in 1997. No photo available but Bing has a satellite view. Located off the port of Lóngmén on the west side of the narrow passage in Qīnzhōu Bay. Accessible only by boat. Site status unknown. CN-4934; Admiralty P3319.575. Date unknown. Active; focal plane 6 m (20 ft); two white flashes every 6 s. 9 m (30 ft) round stone tower. Entire lighthouse is white. No photo available but Google has a satellite view. Located on a shoal off the industrial port of Shílóng on the west side of Qīnzhōu Bay. Accessible only by boat. Site status unknown. CN-4930; Admiralty P3319.3; NGA 20093.6. Date unknown. Active; focal plane 6 m (20 ft); green flash every 4 s. 6 m (20 ft) round cylindrical concrete tower. No photo available, but Bing has a satellite view. Located on a shoal on the west side of the entrance to Qīnzhōu Bay. Accessible only by boat. Site status unknown. CN-4921; Admiralty P3319.4; NGA 20093.65. Date unknown. Demolished around 2008-09. This was a 30 m (98 ft) round steel tower with lantern and gallery, painted red with narrow white horizontal bands. No such tower can be found in Google's satellite view. Formerly located on a prominent ridge on the east side of the entrance to Fángchéng Bay, about 7 km (4 mi) southwest of Qǐshā. Site status unknown. Admiralty ex-P3316.2; ex-NGA 20086. 1999. Active; focal plane 16 m (52 ft); white flash every 4 s. 10 m (33 ft) round white concrete tower with double gallery. No photo available but Google has a satellite view. Located on a small island in the entrance to Qǐshā harbor, just east of Fángchéng Bay. Accessible only by boat. Site status unknown. Admiralty P3316.7. Date unknown. Active; focal plane 12 m (39 ft); three white flashes every 6 s. Approx. 14 m (46 ft) white tower with a black vertical stripe. No photo available but Google has an indistinct satellite view. This is an approach range for Fángchéng harbor. Located on a pier about 500 m (0.3 mi) off the west side of Fángchéng Bay. Accessible only by boat. Site status unknown. CN-4958; Admiralty P3317.4. Date unknown. Active; focal plane 20 m (66 ft); three white flashes every 6 s. Approx. 12 m (39 ft) white tower with a black vertical stripe. No photo available but Google has an indistinct satellite view. Located about 800 m (0.5 mi) northwest of the front light. Accessible only by boat. Site status unknown. CN-4959; Admiralty P3317.41. Date unknown. Active; focal plane about 15 m (49 ft); three white flashes every 6 s. 13 m (43 ft) square concrete tower covered with white tile; there is a black vertical stripe on the front. No photo available but G Google has an indistinct satellite view. Located on the eastern tip of a small island in the center of Fángchéng Bay. Accessible only by boat. Site status unknown. CN-4961.9; Admiralty P3317.9. Date unknown. Active; focal plane about 22 m (72 ft); continuous white light. 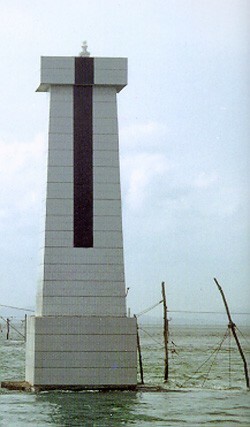 18 m (59 ft) square concrete tower covered with white tile; there is a black vertical stripe on the front. No photo available but Google has an indistinct satellite view. Located on an islet or pier 389 m (425 yd) northeast of the front light. Accessible only by boat. Site status unknown. CN-4961.91; Admiralty P3317.91. Date unknown (station establishment date unknown). Active; focal plane 11 m (36 ft); two white flashes every 5 s. 13 m (43 ft) round cylindrical concrete tower with gallery colored with red and black horizontal bands. A photo is at right but the location is only a vague spot in Google's satellite view. The original light was described as a 6 m (20 ft) "white stone pile." Located on a shoal southwest of the entrance to Fángchéng Bay. Accessible only by boat. Site status unknown. CN-4964; Admiralty P3316.3; NGA 20213. Date unknown (station establishment date unknown). Active; focal plane 10 m (33 ft); two white flashes every 5 s. 12 m (39 ft) round cylindrical concrete tower with gallery colored with red and black horizontal bands. No photo available but Google has a distant satellite view. The earlier light was described as a 6 m (20 ft) square white stone tower. Located on a shoal in the entrance to Zhěnzhū Bay. Accessible only by boat. Site status unknown. CN-4966; Admiralty P3316.13. Date unknown (station established 1966). Active; focal plane 90 m (296 ft); white flash every 4 s. 20 m (66 ft) round cylindrical concrete tower with lantern and gallery. The lighthouse is white, lantern roof red. A distant view is available and Google has a satellite view and a distant street view. The original light had a focal plane height of 79 m (259 ft). 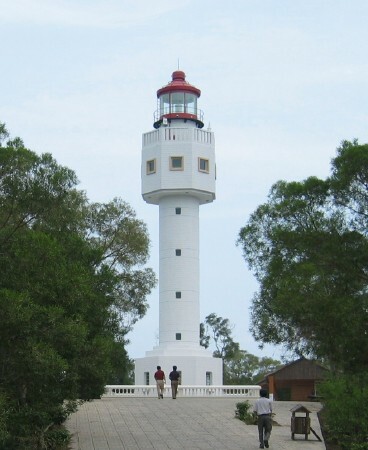 Built to mark the border with Vietnam, this lighthouse is located at the end of the Báilóng Peninsula overlooking the border. Site status unknown. CN-4971; Admiralty P3316.1; NGA 20095. 1972. Active; focal plane 23 m (75 ft); white flash every 4 s. 19 m (62 ft) round white concrete tower. A photo is at right but the lighthouse is not seen in Google's satellite view. The original light was a 12.5 m (41 ft) square pyramidal concrete tower. Located on a shoal in the Gulf of Tonkin, marking the border with Vietnam about 25 km (15 mi) southeast of the mainland coast. Accessible only by boat. Site status unknown. CN-4970; Admiralty P3316; NGA 20215. Posted December 19, 2008. Checked and revised November 29, 2018. Lighthouses: 38. Site copyright 2018 Russ Rowlett and the University of North Carolina at Chapel Hill.